Joanna Bereaud rolled her cart down the hospital hallway. A patient was waiting for her treatment — delivered by maraca and drum. Bereaud, a music therapist at Boston Children’s Hospital, carries a guitar on her back and more instruments in her cart: xylophones, an ocean drum, a rain stick, metal chimes, a kid-sized tambourine. The profession has grown at Children’s, and across the country, too. There are now 6,000 credentialed music therapists practicing in the US, 15 percent of whom work in medical or surgical settings, according to the American Music Therapy Association. Music therapy in children’s hospitals has grown over the past decade, particularly in the neonatal intensive care unit, said association spokesman Al Bumanis. Research has shown music therapy helps patients in a range of settings, including reducing preoperative anxiety, improving motor control, and helping premature babies develop. Children’s started its program in 1996 with just four hours a week of music therapy by students at Berklee College of Music. Now four certified staff work 130 hours per week in the Longwood Medical Area hospital and its satellite sites. “I saw how music was such a link between his disability and being able to express himself,” Bereaud said. Karol, who died at 14, inspired her to use music to help other kids like him. When Bereaud started working at Children’s as a Berklee student, music therapy was restricted to just one type of patient, those awaiting bone marrow transplants. Now any patient can request music therapy. With support from an outside grant, she and other staff treated 9,000 patients and families in 2015, according to the hospital. Bereaud specializes in working with younger patients, including babies in the neonatal intensive care unit, where she helps parents compose songs to sing to their kids. Even when the child is sedated or can’t yet talk, she said, she can often see the melodies’ soothing effect: On the hospital monitors, their heart rates and breathing regulate. Ana, whose first language is Portuguese, struggles to speak English. Bereaud’s job, besides bringing some cheer to the sanitized hospital environment, was to help Ana communicate with hand gestures and words. Does screening children for developmental delays prevent learning problems? That job was made more difficult by hospital protocols: To avoid passing germs to Ana, Bereaud had to enter the room wearing gloves and a mask. So Ana couldn’t see her lips as she modeled words. Bereaud was one of two music therapists on duty that day. 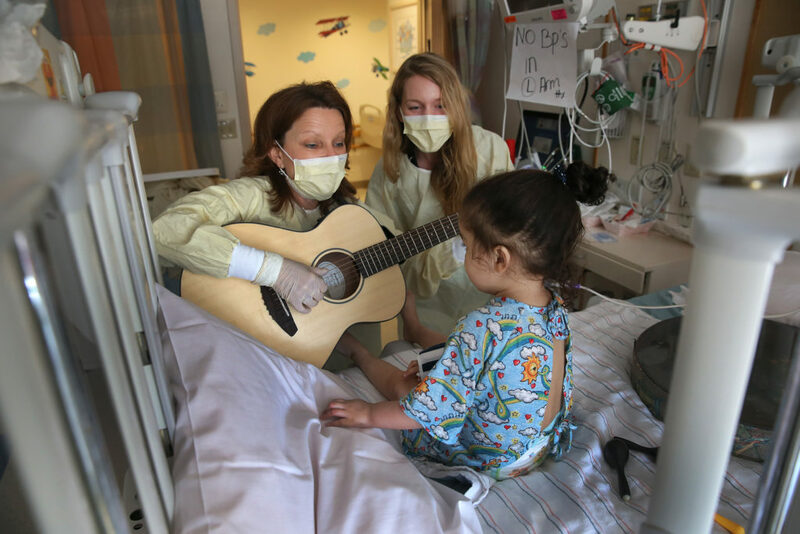 Elsewhere in the hospital, Dana Osterling, who also earned a music therapy bachelor’s at Berklee, moved through the halls with a guitar looking for someone to make music with. After a few dead-ends — her patients’ rooms had signs that said, “I’m sleeping” — she opened the door of a patient she didn’t know. Sean Bowler, who’s 20, had arrived at the hospital for spinal fusion surgery. He sat back in a chair with his feet up, his head immobilized by a brace. “Do you have any songs you’d like to sing?” asked Osterling, pulling out her guitar. She didn’t know his favorite country song, but the two found common ground with a made-up song about shaking, aimed at getting Bowler to participate on the tambourine. Bowler tapped his foot as he shook along to the song. Nine out of 10 music therapy visits at Children’s look something like that — one-on-one visits to the bedside. The musicians often improvise songs, matching the rhythm of the patient’s tapping, or weaving in their names and their families’ names. In her two years on the job, Osterling has fielded some unusual requests: Once, a parent called her to help her kid urinate before a surgery. She wrote a song that went like this: “I gotta go to the potty, I gotta go to the potty … and listen to it flushhh.” The song worked: Music helps the body relax, Bereaud explained. Osterling, who’s 27, has also been called to the bedside for one of the most difficult tasks: helping a family say goodbye to a dying child. One such patient, 12 years old, had been off of treatment for a long time, Osterling recalled. When the girl’s twin sister came to the hospital to say a final goodbye, the family asked Osterling to join the family in song. Thanks for any other excellent post. Where else could anybody get that kind of information in such an ideal method of writing? I have a presentation next week, and I’m at the look for such information. Hey all! Perfect article! I prefer which you represented Music therapy now a fixture at children’s hospitals. My family and i guess this writer supplies massive experience with simply writing and also ability as a copywriter. Functional than an ordinary a way to figure out this dilemma. My name is Ronald Braunstein and I am the Music Director of Me2/Orchestra (“me too.) We are a classical music organization for people living with mental illness or addiction and those that support them. I want to let you know about our orchestra so that you can help spread the word in the music therapy community. We are looking for people who play orchestral instruments (strings, woodwinds, brass and timpani) and want to participate in a supportive rehearsal environment. Members come from all ability and age levels and walks of life. There are no auditions or fees to join. The only requirements are that each person play a classical instrument and be able to read music. I would love for you to pass this information on to people you know who might be interested. I would be pleased to meet with you if you would like more information. Please feel free to contact me any time.